To ensure that no opportunity is missed to find a missing child, Facebook will start delivering Amber Alerts through its News Feed. Beginning next Tuesday, Facebook will be partnering with the National Center for Missing & Exploited Children to pinpoint alerts by location and then post them on the timelines of users nearby. Since Facebook comes face-to-face with 185 million U.S. users, this feature should greatly increase the chances that children will be found. USAToday.com sought out all of the details. Facebook will post all available information, including photos and personal details. Buttons on the Amber Alert will enable Facebook users to share this urgent information with all of their Facebook friends and contacts. 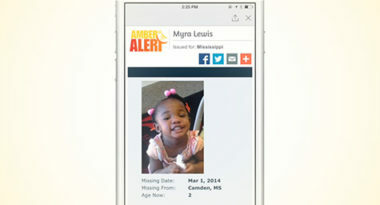 Users can also get the updates and news, plus the missing-child poster through a prominent “Learn More” button right on the alert. There is no need to sign up for service. The network will deliver the alerts automatically the moment a missing child is suspected to be in the user’s area. And with the first hours after abduction mattering the most since the child is still likely to be in the local area, these instantaneous Facebook alerts can prompt the community to help in the hunt. The partnership was inspired by an actual life-saving incident. Last March, a story posted on Facebook made a motel’s front desk clerk realize that she had just checked out a guest who was wanted for abducting his daughter. She quickly called the police and shared this vital information. The Amber Alert system was created in 1996. It was named for Amber Hagerman, who was kidnapped at the age of nine while riding her bike in Arlington, Texas and later found murdered. This sparked public outrage, which led broadcasters in Dallas to team with local law enforcement to start alerting citizens about abducted children. Today, about 180 Amber Alerts are issued every year. Hopefully with Facebook’s help, more missing children will be found. Keep up with the latest trends in social media. Contact MDG Advertising.